Chen Taiji Academy is a loosely organized group of students that has developed around the teaching of Grandmaster Wang Hai Jun (Wang Haijun) in Massachusetts, United States. The focus of training is on the traditional family form of Chen Taiji (Chen Tai Chi). One of the last "outsiders" to be traditionally trained in Chen Village (Chenjiagou), Grandmaster Wang was adopted into Grandmaster Chen Zhenglei's family, as a student, at the age of 9 and became a 12th generation lineage holder of Chen Style Taiji (Tai Chi). He is a four time China National Champion in Push Hands and for three consecutive years, before retiring from competition, he was Overall Champion in Chen Taiji Form, Weapons, and Push Hands. At the age of 16 his teacher, Chen Zhenglei, invited him to travel with him and to help teach and demonstrate his skill. Many of his students have won gold medals at international competitions as a result of the Grandmaster's rigorous training. He takes his relationships with his students seriously and is committed to quality, in-depth teaching. His teaching focuses on the underlying fundamentals and foundational elements of taiji. His workshops are a continuing series in which Grandmaster Wang goes deeper each time, progressively covering the complete system of Chen Taiji. His intent is to teach students to focus on neijin (internal energy) with less emphasis on li, external force. His style lends warmth and humor to the highest level of teaching. Students access Wang Hai Jun's instruction in his home country of England, throughout Europe, the United States and in Brazil. Of the five major family styles of Taijiquan (Tai Chi Quan), Chen Style is the most dynamic and athletic. Chen Style is the original taiji style compiled and developed by Chen Wang Ting in the 1600's at Chen Jiagou (Chen Village), Henan, China. One of Chen style's unique attributes is its emphasis on "spiraling" energy, or Reeling Silk. This fundamental quality of movement is at the core of the system, and is much emphasized in Chen Taiji Academy's approach to teaching. Correctly practiced, with close attention to the fundamental principles of Taijiquan, the practice confers strength, flexibility and the generation of energy that greatly enhances health and longevity. The most important form for developing the principles of Chen Style is called Lao Jia Yi Lu or Old Form, First Routine. The principles taught in this long form are the basis for developing the qualities necessary for successful practice of the Chen system. It is practiced slowly and smoothly, with movement generated from the ground, winding through the body, and driven by the waist. The form also has occasional releases of force or Fa Jin. Practicing the form consistently and with proper principles (centered, open, loose, soft, grounded, heavy) allows the body to become more and more relaxed. The softer the body, the healthier we are--the unconstrained Qi circulates harmoniously, and force then can be emitted in a sudden, powerful yet relaxed release. The more relaxed, the more powerful. Traditionally Lao Jia Yi Lu is taught as the central form in which one trains all of the foundation elements of taiji. This training may take a year or more to master. Once this form is mastered the study of Straight Sword/Jian helps to further refine a smooth, unified body movement and to discover how to extend the energy and intention beyond the limitation of the body--outwards, through the blade and into the point of the sword. Next in the curriculum is the Broad Sword/Dao. This is a dynamic, athletic form intended to develop physical strength and stamina. The weight of the sword helps in discovering the strength and coordination necessary for the jumps and turns that make up much of the form. Next in the system is Lao Jia Er Lu, Old Form, Second Routine or Paochui/Cannon Fist. This is a rousing, martial form that expresses multiple, intense releases of force with the relaxed, unified, whole-body movement learned in Lao Jia Yi Lu. There are additional forms to those noted above. In the 1920's the first Chen master to leave Chen Village and to teach publicly was Chen Fa-ke. During his carer he was prevailed upon to create a new form that showed how the external movements of the body were motivated by internal activity in the lower abdomen/dan tien. He developed Xin Jia Yi Lu and Er Lu, New Form, First and Second Routines. These forms require a softly relaxed body and a well-developed lower dan tien. There are additional weapons forms, push-hands practice, and chin-na practices, however accomplishing the principles taught by Lao Jia Yi Lu is the most important in the foundation of good practice. It is said that Chen Zhenglei and Chen Xiaowang, cousins from Chen Village and two of the four "Diamonds" of the Chen family style, studied Lao Jia Yi Lu for 12 years before learning other forms. Their training took place before and during the Cultural Revolution when times were very hard in China and when traditional practices of energy cultivation were thought to be superstitious and were illegal. When Wang Hai Jun lived in Chen Village taiji practice was allowed, yet he trained with Lao Jia Yi Lu for nine years before learning the other forms. Once the principles of Lao Jia Yi Lu are understood, the other forms in the Chen system come more easily as the principles are the same. Once the principles of Lao Jia Yi Lu are ingrained a push-hands practice can enhance skills. Push-hands focuses on cooperative, choreographed partner exercises that train the practitioner to "listen" to the partner. In this practice one can discover the weaknesses of the principles in oneself and of the partner. Chen Taiji Academy is a loosely organized group of students that has developed around the teaching of Grandmaster Wang Hai Jun in the United States. Grandmaster Wang first began teaching in the United States in 1999, while traveling with his teacher Grandmaster Chen Zhenglei. In the early visits a small group of students immediately appreciated his hands-on style of teaching, his willingness to convey the principles of taiji, his personal warmth, and his obviously great level of accomplishment. The initial group has become larger, yet still is small enough to feel like family. 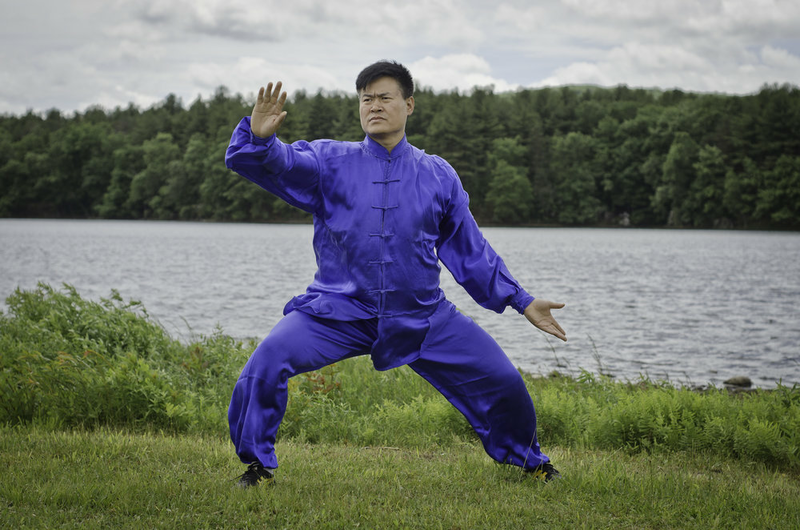 Grandmaster Wang regularly travels to western Massachusetts; Knoxville, Tennessee; Baltimore, Maryland and Hillsborough, NC. Practice groups have formed in these regions in order to maintain momentum between visits. Instructors Marc Gerstein and Leslie Franks are among Grandmaster Wang's senior students in the United States. They were in the first group to be introduced to Grandmaster Wang in 1999, and were his original hosts in the States, along with Stan Baker and Margery Gerard. Marc has practiced Acupuncture and Chinese Medicine since 1984 and has an active practice in Bloomfield, CT. Leslie has practiced Oriental Bodywork since 1990 and has recently published Stone Medicine: A Chinese Medical Guide to Healing with Gems and Minerals. Each has a long history of martial arts, qigong and meditation practice, which enhances their ability to convey the health giving principles of Chen Taiji. Marc and Leslie have both received Taijiquan Instructor Certificates from Grandmaster Wang. They can be reached at chentaijiacadem@charter.net. Stan Baker has been practicing taiji and other internal martial arts since the early 1980's which gives Stan a unique perspective on his current practice and study of taiji. He has an active Acupuncture practice and is a practitioner of Zen Meditation The pinnacle of his study of the internal martial arts is his study with Grandmasters Chen Zhengei and Wang Hai Jun, which started in 1999. Stan has received the Taijiquan Instructor Certificate from Grandmaster Wang. Stan teaches in the Hartford CT area and can be reached by phone at 860-836-1068 (cell).